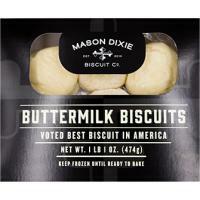 Our Buttermilk Biscuits are a perfect balance of flour, butter, buttermilk and love. Handcrafted and hand-cut, so excuse our imperfections. Enjoy the rich, buttery flavor and moist, flaky goodness. Pair with your favorite jam or honey. Perfect as a sandwich, a side, or the best topper to a cobbler ever.